The Downtown Los Angeles streetcar system is a proposed 4 mile route that will connect major entertainment, recreational, and employment centers. Urban One is managing Los Angeles Streetcar, Inc., a sole purpose non-profit dedicated to the development of a streetcar in Downtown Los Angeles. Urban One lead the funding, design, and development in the infancy of the streetcar, which included: community, governmental, political, and stakeholder outreach; a full EIR; financial analysis and valuation of public financing districts; and substantial management of engineering consultants and construction firms. Los Angeles Streetcar, Inc., (LASI) is a 501(c)(3) non-profit public/private partnership modeled after the successful public-private/non-profit partnerships in Portland and Seattle, which pioneered modern streetcar systems in the United States. LASI was founded by long-time Downtown Los Angeles stakeholders in January 2009 to lead the fundraising and development efforts of the streetcar project, including oversight of all required planning, environmental, engineering, and development processes. Strong and continued support from Councilmember José Huizar, Councilmember Jan Perry,Congresswoman Roybal-Allard, the Bringing Back Broadway Initiative, the Community Redevelopment Agency, LADOT, METRO, the City of Los Angeles, and Downtown Stakeholders has allowed LASI to quickly move the project forward. For a full list of supporters to-date, please click here. LASI is supported by a Board of Directors that represents the diversity of interests in Downtown Los Angeles. Though streetcars are not a new concept to the City of Los Angeles, many long-time residents are surprised to learn that L.A historically had one of the most extensive streetcar systems in the world. The sublinks above detail how streetcars contributed to Los Angeles’ growth and how they can once again connect communities and create a sense of place. In addition, these sections note how streetcars are distinctly different from other mass transit options, and why they enjoy an advantage over alternative transportation methods. Since streetcars use electricity, rather than a combustion engine to operate they offer several environmental benefits, including noise, emissions, and growth. The noise pollution on heavily traveled bus corridors is often unbearable to residents, businesses, and visitors. In Downtown L.A., this audible barrier stifles not only economic investment, but prevents a mixed and varied collection of uses in public areas and along sidewalks. The electric motors streetcars employ are virtually silent, and will encourage more active uses and outdoor activities by replacing local bus connector routes and the noise they generate. Combustion engine emissions have proven detrimental health effects for those that must breathe them on a daily basis. Though electric power plants produce similar health problems, they are not typically located in densely populated areas like Downtown L.A. Furthermore, the Los Angeles Department of Water and Power has pledged to reduce their dependency on high-polluting coal power by 7% and increase the total supply of renewable energy to 20% by 2010, which would further reduce harmful emissions associated with electricity generation for the streetcar. In effect, energy generated to power the streetcar will be cleaner and more renewable, and in return, will enhance the health and well-being of L.A. residents. The Los Angeles area is expected to experience tremendous population growth in the next 50 years. A complete and easy to use transportation network, which the streetcar will be a part of, will ensure that a substantial percentage of this growth occurs in dense urban areas like downtown instead of at the fringes of the city. This form of growth is sustainable as it encourages development that maximizes existing infrastructure, decreases vehicle trips on freeways and arterials, reinforces walkable neighborhoods, and enables a wide spectrum of economic opportunities. Buses are excellent local and regional public transportation options, but they will do little to spur redevelopment and economic investment in Downtown LA. This is due to the inherent flexibility of bus service, as routes change regularly to accommodate varying needs; in addition, buses contribute to nerve-racking pedestrian experiences due to heavy street-level emissions and noise pollution that discourages active use of sidewalks. Streetcars do the exact opposite. They provide developers and business owners certainty that the routes will not change, and are considered preferable to buses by residents, visitors, and employees as they offer more amenities, highly reliable routes and timetables, and enhanced urban experiences. Buses and streetcars do, however, work together to connect access points within regional transportation networks. For example, sidewalks can be designed to specifically accommodate both vehicle configurations; in return, a transit stop effectively doubles its value within a regional transportation network. In 2001 the Community Redevelopment Agency of the City of Los Angeles (CRA/LA) received a $100,000 grant from the U.S. Department of Housing and Urban Development to perform a study on the feasibility of creating a modern streetcar in Downtown Los Angeles. The goal of the feasibility study was partly to determine potential physical designs, but was primarily focused on investigating how a streetcar would encourage redevelopment and smart growth in the Downtown area. The “Feasibility Study for the Resurrection of the Red Car Trolley Services in the Los Angeles Downtown Area” was finalized and distributed to the public in July, 2006. 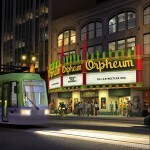 The CRA/LA has further supported the streetcar by hiring IBI Group and HNTB to create several conceptual designs/drawings detailing how the streetcar would function and interact along Broadway and within Downtown, and to investigate potential engineering challenges, encumbrances, and funding options. In the spring of 2008, two dozen downtown leaders and streetcar advocates visited the Pacific Northwest to meet and learn from key figures of the Portland and Seattle streetcar systems. The goal of this trip was to learn how Portland and Seattle were able to secure the funding and public support necessary to transform their projects into reality. After much public input and outreach, LASI has developed conceptual streetcar alignments for further public review and study. The intent of the conceptual alignment study was to capture critical nodes within Downtown L.A. (such as Broadway, L.A. LIVE, South Park, etc.) that are integral to Downtown L.A.’s long-term growth and development. The core services map generally illustrates the areas that the streetcar routes worked to include. For more information on the current proposed streetcar routes, check out LASI’s website here. Many people, especially property owners, are concerned about the physical construction of a streetcar. Lane closures for rail construction will be necessarily, but once completed, new low-profile track designs enable roadways to accommodate streetcars, cars, trucks, buses, and other motorized vehicles. In addition, streetcar construction can occur at a very rapid pace; for example, in Portland it took only one week to complete one block (200 ft) of new track and typically required one lane of temporary road closures. One difference between streetcar and light-rail construction is that a streetcar is a much smaller and therefore weighs a fraction of a light-rail car. Because of this, only a trench 8 feet wide and one foot deep needs to be removed from the roadway. The construction crew then reinforces the area with rebar, fills it with concrete, and positions the rails. 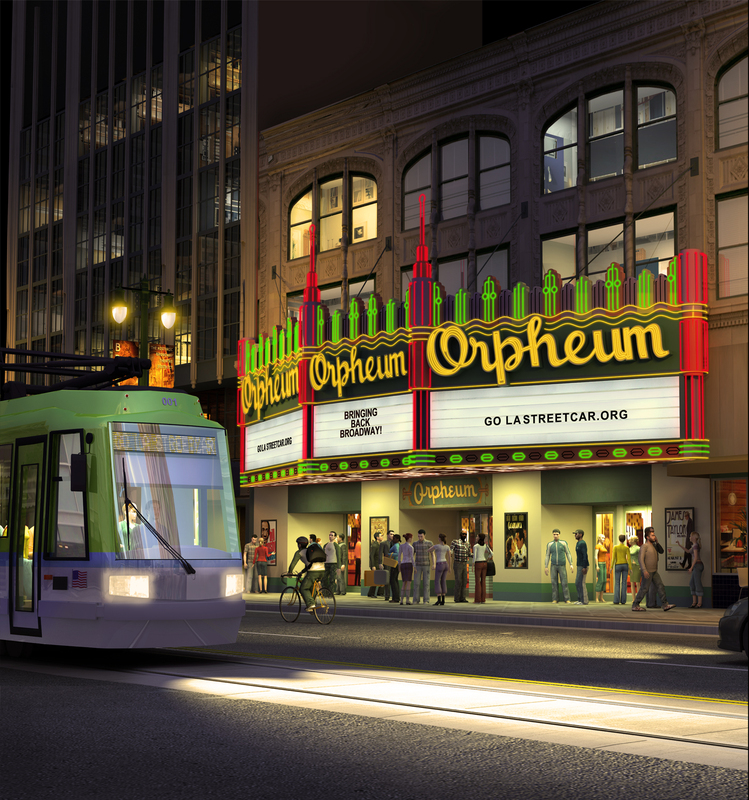 The financing plans for streetcar projects can best be characterized as the creative leveraging of a diverse array of federal, state and local funding sources. In fact, most public private partnerships — whether infrastructure, transportation, or otherwise — combine these various funding sources together for the greater good of both their own interests and the communities they participate in. Streetcar projects have a unique advantage in relation to other transportation and infrastructure projects, as they have a measurable effect on the property values and neighborhood growth patterns in the cites where they are constructed. This characteristic is what gives both property owners and government officials the confidence to invest significant capital resources over long periods of time. There are numerous stories from stakeholders in other cities citing the phenomenal return-on-investment that a streetcar system provides. For more detailed information on how the Los Angeles Streetcar will be financed, please click here. Check out some photos of the Downtown Los Angeles Streetcar project on Urban One’s Flickr page.